UC San Diego's Rob Knight opened the conference with his talk on scaling up from the human microbiome project to the Earth microbiome project. 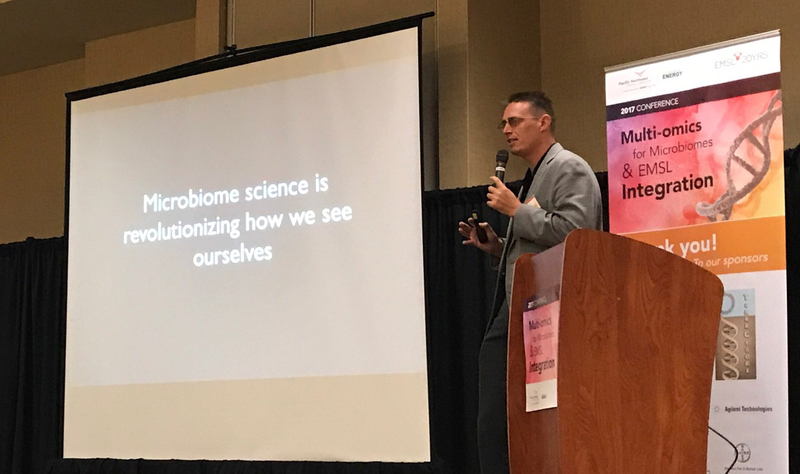 The slide in the photo says "Microbiome science is revolutionizing how we see ourselves." PASCO, Wash. — Almost 200 scientists representing 12 countries came together at a recent conference to share insights into the world of the very small: microbes. From Aug. 1 to 3, researchers discussed microbial communities from across the globe. Some grow on teeth, others catch the sun's rays while bobbing along in the ocean and still more soak up moisture in the soil that covers the forest floor. "This conference was unusual in the way that it brought so many different disciplines together," said conference chair Janet Jansson, a microbiologist at the Department of Energy's Pacific Northwest National Laboratory. The Multi-omics for Microbiomes conference focused on different approaches that let researchers paint better pictures of microbial communities. Some methods determine what molecules and nucleic acids — tools that microbes use to communicate and grow — are present. Other methods use computational tools to analyze and visualize the complicated datasets that laboratory studies generate. This event was co-hosted by PNNL and EMSL, the Environmental Molecular Sciences Laboratory, a DOE Office of Science User Facility at PNNL. PNNL postdocs Peyton Smith and Taniya RoyChowdhury said they found the conference both useful and awe-inspiring. They acquired helpful hints for their own projects and learned about completely different research areas. "That is the real hallmark of success," Jansson said. "When you come to a conference and then you leave with new aspects of knowledge." Check out PNNL's Twitter Moments feed below to get a taste of the conference.